SpaceX founder Elon Musk was named one of the 25 most influential people in space in the new book "New Frontiers of Space." 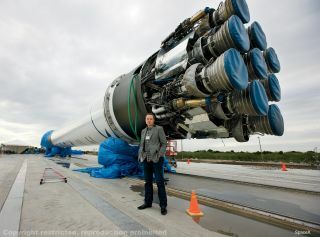 He stands next to the cluster of Merlin engines attached to the private spaceflight firm's Falcon 9 rocket. Image uploaded on July 25, 2013. There is now a schedule for the big reveal. Billionaire entrepreneur Elon Musk, who runs the electric-car firm Tesla and the private spaceflight company SpaceX, will unveil the design of his proposed "Hyperloop" travel system today (Aug. 12) at 4:30 p.m. EDT (1:30 p.m. PDT; 2030 GMT). "Pulled all nighter working on Hyperloop (as did others). Hopefully not too many mistakes. Will publish link at 1:30 PDT," Elon Musk (@elonmusk) tweeted today. Musk has said that the Hyperloop could get passengers from Los Angeles to San Francisco in less than 30 minutes, meaning it could travel faster than 600 mph (966 km/h); that it would be solar-powered; and that tickets to ride a Hyperloop vehicle would cost much less than seats aboard a plane or train. Further, in May, Musk described the Hyperloop as a "cross between a Concorde and a railgun and an air hockey table," leading many amateur tech sleuths to imagine a system that pneumatically blasts passenger-packed pods through long tubes. We'll see what all the fuss was about in just a few hours.